Don’t share your User ID or password with anyone and don’t write it down. If you share your password with a third party, you assume responsibility for their actions. Avoid accessing your account from public computers in Internet cafes, libraries, hotels, etc.,—they can be accessed by malicious users who may have installed software in them to record your keystrokes. Many Internet scams today involve email messages that appear to come from a trusted source, but are not trustworthy. Additionally, email attachments can be harmful because they may contain viruses. The email claims to be from a person in authority requesting a copy of a password file, User ID, Social Security number, or banking information. Right click on the link in the email and select properties. If the section under URL Address contains an “@” symbol or does not appear to be a tdameritrade.com address then it is likely fraudulent. Do not visit links sent by email as these can lead to phishing sites— sites made to look legitimate and designed to collect your personal information. One way to avoid this is to enter the URL into your browser instead of clicking the link. Turn off the “preview pane,” as this allows some viruses to be executed even if you never actually open the email. Report suspicious email to your advisor and BCJ Financial Group. Don’t base your password on personal information—such as the name of your pet or your company. Don’t use a word found in the dictionary as your password. Avoid substituting numbers for letters, for example: using a zero for the letter “o” or a one for the letter “i.” These substitutions are well known and predictable. Don’t use your User ID as your password. Look at the website address. If you are on a secure site, the address will include https:// instead of http://. The extra “s” stands for secure. Look at the bottom of your browser or at the top (after the address bar) for a lock or key icon. This indicates a secure connection. Each secure site comes with a digital certificate, establishing its legitimacy. To view the certificate, double-click on the lock or key. If you get a pop-up message indicating a problem with a site’s Security Certificate, do not proceed. The website should be secured with a digital certificate, which verifies you’re at a legitimate website and not a “spoofed” site. It’s important to be aware of possible risks to your computer and the information on or passing through it. We have a designated team responsible for reviewing potential threats to clients’ assets and information. Your awareness, combined with our vigilance, can help to decrease the risk to your accounts and information. Identity theft—using a person’s personal or financial data to commit fraud—is one of the most rapidly growing global crimes. The targets of this crime are personal information, financial information, and access to online accounts. Phishing happens when someone attempts to steal personal or financial information. It usually starts with an email asking for sensitive information, such as your User ID or user name, your password, or your account information. Phishing—sometimes referred to as pharming—opens the door to identity theft and computer security breaches. Please note: BCJ advisors and staff, and any of their affiliates will never ask you for your account number, User ID, PIN, password, or any other personal information in an email. (In rare cases, however, we might need to ask you for the last four digits of your account number for identification purposes.) For more details on how you can help protect your investments, log in to AdvisorClient.com and access the Security Center from the Client Services tab on the site menu. If you’re anything like the guy in the video to the left you need a password manager. Dreaming up a different password for every site and service is the only way to keep your stuff safe online, but it’s also a gigantic nuisance. There’s one thing you can—and should—do to help: Get a password manager program. The three programs below all will help in lessening your password woes. Please see the break down below and choose one that would work for you. But, wait—isn’t storing all your passwords in one place a terrible idea? It’s better than reusing easily remembered passwords everywhere. Password managers hide your information behind a master password that only you know. Nothing is 100% guaranteed, but all three of these managers take the additional security step of never sending your master password over the Internet. They’re like a safe-deposit box that a professional keeps without knowing what’s inside, or even holding a key to open it. In an age where more of our personal information lives, password protected, up in the cloud, we need defenses beyond antivirus software. Using a password manager is the next step. These programs are becoming increasingly popular as hackers try to infringe on your personal data through passwords that can be cracked as easily as eggs. Here, I’ve put three of the most popular password managers to the test to help you choose the software that best suits your needs. Like1Password and LastPass, Dashlane uses the AES-256 encryption for its database. The key that encrypts the data is derived from the master password: the decrypted data is not stored on your device or Dashlane’s servers. Dashlane gives you the possibility to keep encrypted data locally on one device, or to sync it between multiple devices via Dashlane’s servers. The encrypted data is hosted on Dashlane’s servers and is downloaded and decrypted every time. Just like Lastpass, Dashlane lets you add two-factor authentication options to enhance the security of your master password. Dashlane is compatible with Chrome, Firefox, Internet Explorer, and Safari. The application lets you import your saved passwords in Firefox or another browser. Dashlane sends security alerts directly to your devices when your passwords could be compromised. Dashlane also advises on the saved passwords. With Lastpass, all your data is encrypted locally on your PC using AES 256 encryption, and you’re the only one who can unlock it. Your key doesn’t leave your device, and it’s never shared with LastPass. The only downside is that the program requires an internet connection because the encrypted data is hosted on LastPass servers by default. Fortunately, you can access the data without an internet connection through the LastPass Pocket app. One good thing is that LastPass supports two-factor authentication. It’s a practical solution to add another layer of security to the master password. LastPass is compatible with the following browsers: Chrome, Dolphin Browser, Firefox, Firefox Mobile, Internet Explorer, Maxthon, Opera, and Safari. The app also imports existing passwords from Firefox and Internet Explorer. LastPass offers a line of defense against phishing attacks, and it will not fill in forms hosted on malicious websites. The application also analyzes passwords to find out if they’re weak: LastPass will warn you when you’re using a weak password when logging into your accounts, and it’ll send you security alerts every time a new security breach is discovered. 1Password uses AES-256 encryption but stores all your data locally on your computer. Even if you choose to synchronize your data with other devices, your master password, the unique decryption key, never leaves your computer or device. Decryption is always done locally and the decrypted data is never written on the disk. With 1Password, using the cloud is an option, not a requirement. The software lets you synchronize data between devices via iCloud and Dropbox, or locally through Wifi. It’s an ideal solution for mobile users who are more cautious about the cloud. 1Password is compatible with Chrome, Firefox, Opera, and Safari. Extensions allow the app to automatically save new passwords entered in the browser and to automatically fill out forms with just one click. The Watchtower feature in 1Password identifies sites that are vulnerable to cyber attacks and tells you which passwords you should change. The app will tell you which sites to avoid, and gives you the green light to change your password after covering security holes. Another good feature is that 1Password will also tell you if your passwords aren’t safe enough, are duplicate, or are obsolete so that you can update them. All three password managers are very similar in many ways. On a security level, they all use the AES-256 security standard and store their data locally. In the end, your preference for one or another will boil down to the additional features of each program. Dashlane’s mobile apps will give an experience (auto-completion, generating passwords) that’s very close to what is offered for PC thanks to a dedicated keyboard on Android and a full browser on iOS. For LastPass, it’s the unparalleled variety of available platforms what will make the difference. Of the three, this is the only one that supports Linux, BlackBerry, Windows Mobile, Symbian, and Firefox OS, an ideal choice if you’re using one of these platforms. The app, however, syncs your encrypted data on its servers by default, a solution that will discourage those who are most skeptical about cloud security. 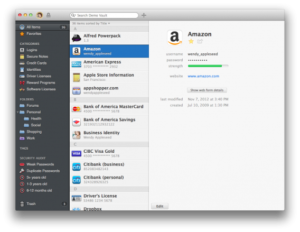 1Password is notable for how easy it is to use and its elegant design. If you fear that you’ll end up with something indecipherable, 1Password is a good solution. 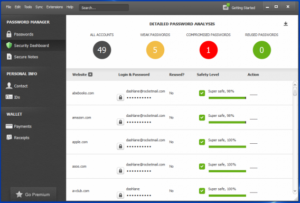 This is indeed the best password manager for less advanced users, and the function that lets you sync data between devices via Wi-Fi could attract savvy users not wanting their data copied to the cloud. Securities offered through World Equity Group, Inc., member FINRA and SIPC, a Registered Investment Adviser. Investment Advisory Services offered through BCJ Capital Management. BCJ Capital Management and DBA name are not owned or controlled by World Equity Group, Inc.